Last night was a big night for all of us on the Avenue Q tour. 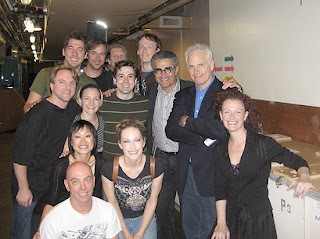 In the audience were none other than Christpher Guest and Eugene Levy! After the show they came backstage and said Hi and we got the above picture taken with them. I got to talk to them a little and told them how much of an honor it was to meet Nigel Tufnel and one half of the Schmenge Brothers! Eugne Levy was tickled by the comment and thanked me and then they left and we all sat around and quoted their films for hours. Anyway, it brings me to todays post. Back in the mid 80s, SNL was not doing so well. But there were a few bright moments. One of them featured Christpher Guest and Billy Crystal as two nightwatchmen who would go on and on about how things hurt them and then they would always say "I hate when that happens." This skit became so big that they even recorded it with backing music for Crystal's album, "Marvelous". Here is the single version for you now. Enjoy! Here's a great silent 8mm castle films reel of Abbot and Costello in "Have Badge Will Chase". Though not from my collection it is still pretty cool! Enjoy! I'm in LA right now and everywhere I look I see an advertisement for the new Bionic Woman. I've already seen the first episode and I really didn't think it was that great. But that's just my opinion. I'm hoping that with all of the hype for the new series that the official US DVD release of the original Six Million Dollar Man finally sees the light of day. In the meantime, you can listen to the first Power Records version of the show here! That's what I am offering you today. This album has been in my collection since I got it as a kid when it was first released back in the 70s! I can quote almost every line from the album and the cover alone is worth its weight in gold! Here it is for you now! Enjoy! Sorry about the lack of posts this past week. My computer was having issues and where I am currently staying (I'm on the road with the National Tour of Avenue Q) I can't get a decent signal. Thus my on-line time last week was entirely at the mac store where I was limited to what I could do. Anyway, I return to the land of blogging with not one but two posts in the same veign as my last two! First up is a cool record I found at a thrift store around the corner from my house. There is no artist or group name on it. In fact, I'm not really sure what the title of the album is. I guess you could call it "New Original TV Themes". 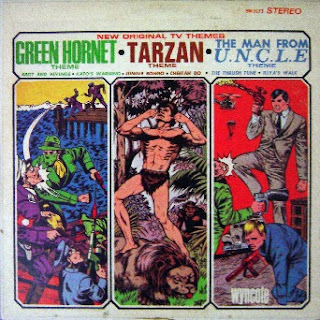 Either way it focus' on three shows: "The Green Hornet", Tarzan" and "The Man From U.N.C.L.E." It features the themes to all three shows and each show gets two original songs complete with sound effects and cheese! All in all, a keeper! Enjoy! 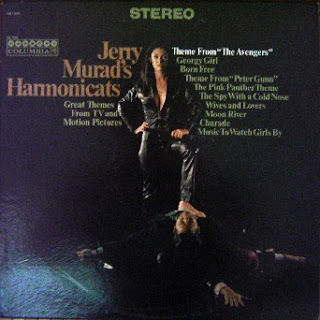 In addition to the "Avengers Theme", the harmonicats take on "Peter Gunn" as well as movie themes such as "Born Free", "Georgy Girl" and "The Pink Panther". This one is sure to please! Enjoy and I promise to keep up on the posts as I am able! Thanks.